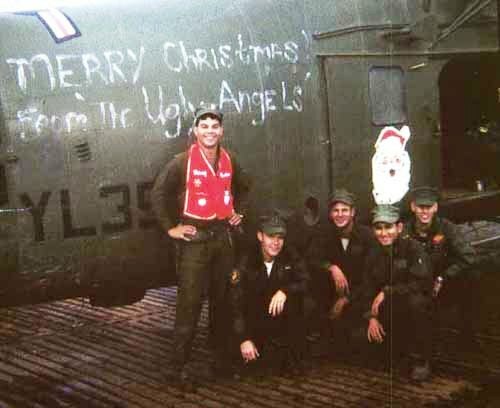 Christmas 1967, Khe Sanh, celebrated Ugly Angels style! Capt Ben Cascio, standing, with fellow Ugly Angels in the foreground. An upside to searching for the remains of my first husband, Capt Jerry Zimmer, USMC, an F4 Phantom pilot shot down in the Que Son Mountains of Vietnam and MIA since August 29, 1969, is my renewed respect for Marines whose countless acts of bravery during the Vietnam War saved the lives of many fellow Marines. One of those heroic acts was recorded on April 30, 1968–the first day of the hard-fought, four-day Battle of Dai Do. Stationed aboard the Iwo Jima—a Landing Platform Helicopter (LPH) ship, floating about five miles off shore, from the mouth of the Cua Viet River in South Vietnam, Capt Ben Cascio and his crew of Ugly Angels (HMH-362) were on medevac stand-by when the call came from a unit with the 2nd Battalion, 4th Marines (2/4), requesting a medevac for five seriously wounded Marines. 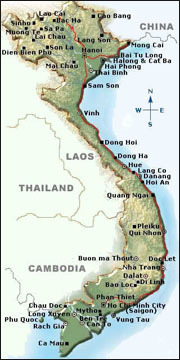 Within minutes, Ben and his wingman, 1st Lt Robbie Robertson, were at the controls of their H-34 helicopters, en route to Dai Do, a stone’s throw from Dong Ha and approximately eight miles south of the DMZ. Flying in the dead of night with 850 missions to his credit, Ben was unaware that the mission they were about to undertake would become a true Marine Corps legend. As I prepare to write this blog, Ben has one request: “Please don’t call me a hero — this mission was a team effort.” But even with the passage of time, many of his Marine Corps brethren still credit Ben with an enormous heroic feat that earned him the name, “The One-Eyed Ugly Angel” — a moniker that Ben wears with pride. I think you’ll agree that his story makes us all proud, no matter what we call him. Before Ben and his crew of Ugly Angels — co-pilot 1st Lt. Larry Houck, crew chief Bob Bush and a gunner — dropped into the zone, he radioed ahead to the troops on the ground when he was a couple of miles out, telling them to put a strobe light where they wanted him to place his right wheel. They were flying into the zone without lights, and this would become the pick-up point for the medevacs. Ben was told that there had been heavy fighting earlier, but it was quiet at the moment. “When I broke the coast, I told Robbie to stay high and cover,” said Ben. PLEASE CLICK HERE FOR CONTINUATION OF THE ONE-EYED UGLY ANGEL STORY. This entry was posted on Friday, April 1st, 2011 at 3:10 pm	and is filed under Vietnam Heroes, Vietnam Heroic Efforts. You can follow any responses to this entry through the RSS 2.0 feed. You can leave a response, or trackback from your own site. Thanks so much for sharing this story. My husband is currently a pilot with the Ugly Angels stationed in K-bay Hawaii. I haven’t heard this story before and I always love to learn more about the squadron’s history. In March the Uglies returned from another successful deployment to Afghanistan. Thanks Krista — You sound like a great Marine Corps wife! And thanks to your husband for his service — we are so proud of the Ugly Angels at K-bay. What a great story. He earned the nicknames the hard way, and no matter what he says, he is a hero and will become a legend. Bless you Elaine for writing this. I will share it with my TBS mates when we reunite after 45 years at Quantico next month. I will also proudly share it with my current golfing veteran buddies. Semper Fi. Tremendous article Elaine. I was fortunate to meet Ben at a Battle of Dai Do PME at the National Museum of the Marine Corps in the spring of 2009. And, then Leatherneck published our two-part article on the battle, where the heroism and unbelieveable flying of the “One-Eyed Ugly Angel” is described, along with the actions of other magnificent Marines and corpsmen of 2/4. Keep pressing the attack Elaine. We need you. Walt — Thank you for the kind comments — they mean a lot coming from one of the best editors out there. It was a pleausre to cover Ben’s story, as you can imagine. I appreciate all that you do for Marines–active duty, retired and our MIAs. So proud to call Ben Cascio my Uncle! just a great guy! if you get the chance to sit and talk with him…do it! you will learn so much! Thanks, Melanie — I agree! My daughter serves in the Marine Corps in San Diego as a helicopter mechanic. On 11/ 19/15, I had the honor to meet Ben Cascio at a Social gathering. I’d never heard the story about the One-Eyed Ugly Angel until that night. We sat down and talked for hours. Ben was interested in my daughter’s story and listened with so much emotion. He did not say much about himself until the end of the night and said, “Let me tell you about my story.” He went on with so much emotion, like he was reliving that event. I held back my tears as he told his story. Thank you my friend, Ben Cascio …. Robert — Ben is a very humble, caring guy. I have been a writer for nearly 30 years, and that story still gives me goose bumps. I am certain that Ben was very proud to know that your daughter is a Marine helicopter mechanic — that’s pretty impressive!